Since we’re in the throes of yet another house renovation, I’ve been on the hunt for home décor in all its many iterations – from paint and wallpaper to accessories and accent chairs. Redoing a house from top to bottom can be so overwhelming: I remember my frustration the first time around when I was staring at a series of blank canvases with no idea where to begin. Some experts say it’s best to start from the ground up by choosing a rug; others cite fabric as the launch pad; still others make wallpaper their muse. In the end, I ditched all that expertise and went with objects that inspired me. Sure, for some spaces that meant starting from a fabulous fabric and then pulling in pieces that complemented or coordinated. But for other rooms, I’d find a piece of furniture – a beautiful accent chair or a pair of raffia-covered nightstands – and riff from there. In the new house, one of my favorite spaces – and a considerable challenge design-wise – is a light-filled room that used to be a sleeping porch. One side is a wall of windows facing the front yard, the other side a wall of windows facing the upstairs hallway. It’s a fishbowl of sorts and doesn’t really serve a distinct purpose: it doesn’t work as a place to watch TV, it’s definitely not a bedroom and it’s too on-display to be my home office. Right now, it’s just a clean slate: white walls and a (freshly-stained) floor, so when Chairish.com approached me about their White to Bright room design challenge, I was ready to start working this mother out. With the idea of “escape” to guide me, my mind started wandering to paradise… High-gloss greens, bright pops of pink, dreamy blues and lush tropical florals. The first piece of the puzzle came together when I alighted upon this pair of vibrant Pink Empire Chairs. Aha! This is where I’d sit and sip tea – or send my three year old for a very elegant timeout after half-drowning his brother in the bathtub. So chic. I’d stash these Montsera Palm pillows on each chair and plop a pair of chinoiserie-inspired green trellis ottomans in front. 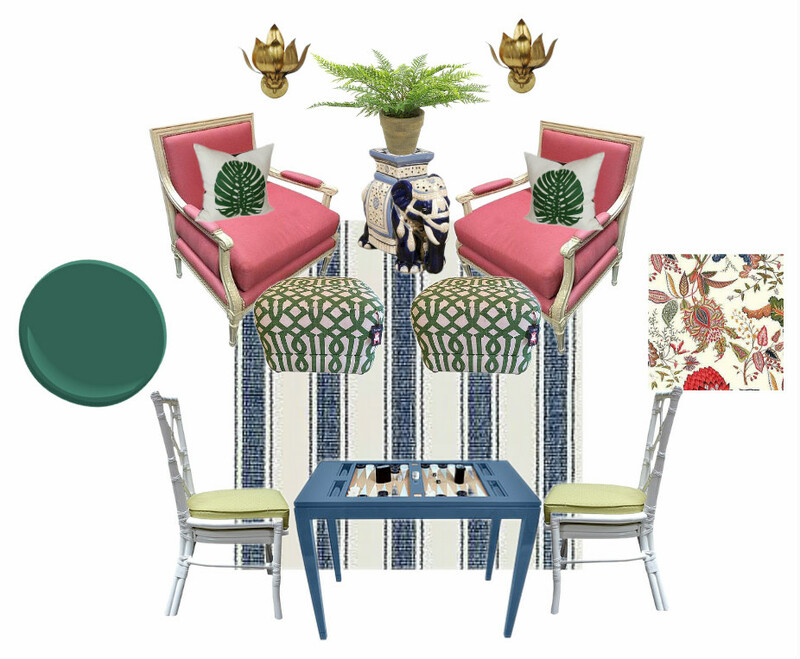 On the other end of the room I’d situate two Rattan-style chairs between a backgammon table in New York Blue, for all those opportunities my husband and I have to just hang out and gaze into eachother’s eyes. Again, if I build it… I’d punch up the Rattan chairs’ seat cushions by dressing them in Gaston Y Daniela’s Paraiso fabric, matching the pinch pleat drapes I plan to use to frame the windows facing the front yard. On the floor, I’d pull in some of the blue from Paraiso with Dash & Albert’s Blue Awning Stripe cotton rug. The walls I’d lacquer in a lush jungle green like Benjamin Moore’s Brazilian Rainforest 651, including the moldings and built-in bookshelf for an even richer feel. I’d also run with the greenhouse vibe and perch a billowing fern – or five – on an elephant stool. What I wouldn’t give to have a beautiful reading room! Love those ottomans!